Lexi’s birthday festivities on Saturday evening in Whistler were celebrate at Araxi Restaurant + Bar. Araxi is consistently voted top restaurant in Whistler, and was made even more famous by Chef Gordon Ramsay’s television program Hell’s Kitchen. Grand prize winning chef of Season 6, Dave Levey, was rewarded with a position at Araxi during the 2010 Winter Olympics, cooking under current Araxi Executive Chef James Walt. We had previously arranged reservations, so we were promptly seated upon our arrival. 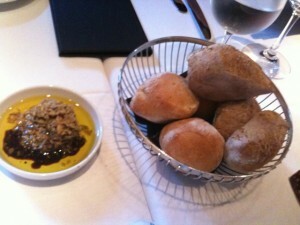 Hearty, rustic buns were presented with a trifecta accompaniment including olive tapinade, balsamic vinegar and olive oil. 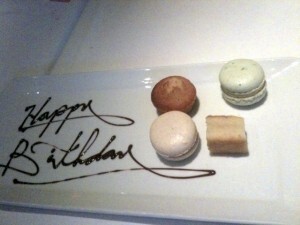 We perused the menu and wine list, and commented on the restaurant’s comfortable, yet elegantly decorated dining room. We sampled a few wines from their extensive, one-of-the-best in the province wine collections including a cellar comprising over 11,000 bottles. Our unanimous favourite was a BC dessert wine, Elephant Island Framboise ’09. Since we indulged during breakfast and lunch, we were still satiated at dinner time. In lieu of appetizers and main courses, we each ordered a couple appies off their “Small Plates” menu, and ended the evening with a few delectable desserts. Praise should be shown to Araxi for its commitment to sourcing local ingredients from neighbouring community farms in Pemberton Valley. 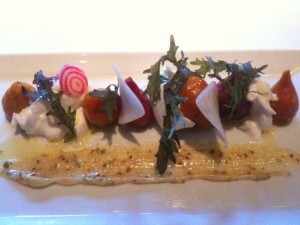 Roasted North Arm Farm Beet Salad ($15.50) – Buffalo mozzarella, ruby streak lettuce, beet chips with an orange, grapefruit and mustard emulsion. My friend and I both ordered this salad, and felt the dish was beautifully attuned. The mozzarella was the smoothest, creamiest bocconcini we’ve ever experienced. 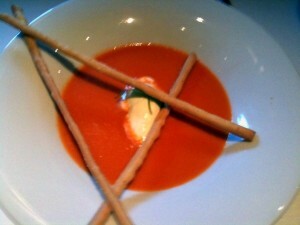 Smoked Tomato Soup ($13.00) – Okanagan goat cheese mousse with organic olive oil and parmesan grissini. Poured table-sized, this aromatic soup was liquid tomato comfort. 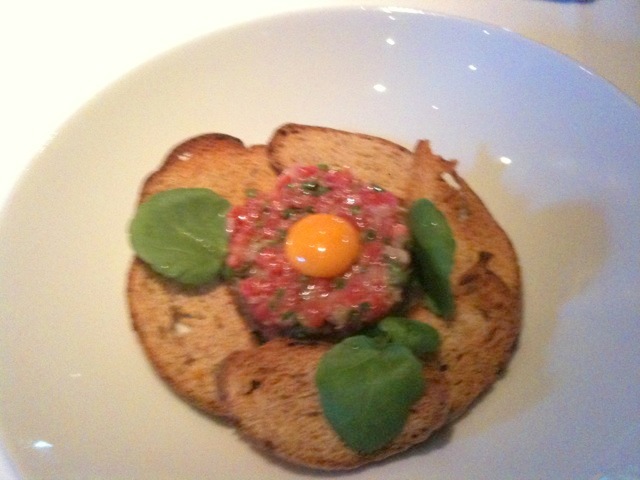 Cutter Ranch Beef Tartare ($17.50) – Organic beef (raised for especially for Araxi at Cutter Ranch in Clinton BC), tossed with capers, shallots, parsley, truffle in a red wine vinaigrette. Both Emmy and Krystle ordered this dish, and thought the melt-in-your-mouth beef melded well with the quail’s egg. 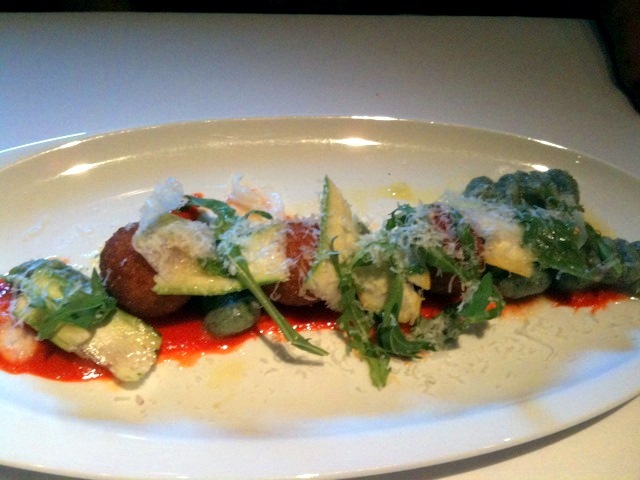 Spinach + Nettle Gnocchi ($17.50) – Crisp heritage angus beef cheeks with roasted piquillo peppers, fennel puree, arugula and shaved summer squash. Although this dish was delectably flavoured, the beef cheeks were actually golden deep-fried orbs – which the menu missed mentioning. 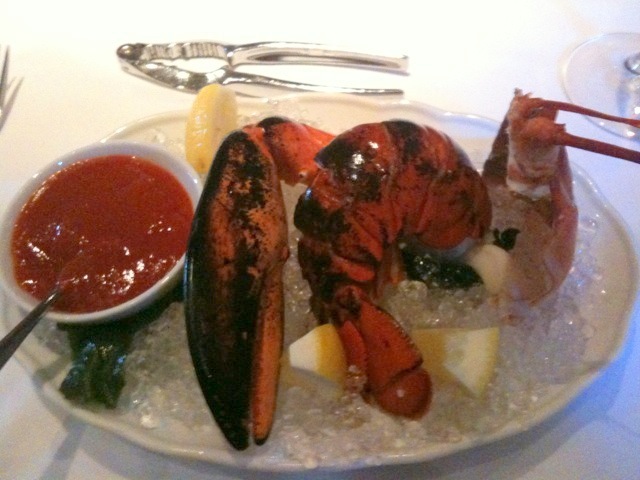 Maritime Lobster Cocktail (half pound $18.50/ one pound $36.00) – Served in the shell with house prepared cocktail sauce. Dungeness Crab Roll ($17.50) – Wrapped in a thin egg crepe with Tofino crab and yuzu mayonnaise served on organic tomato gazpacho with basil sorbet. This dish was considerably rich due to its generous portion of crab meat. 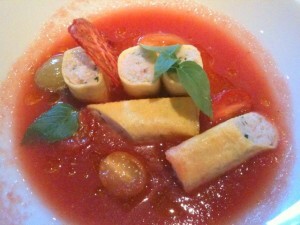 I adored the gazpacho, but did not appreciate it accompanied with the sweetness of the sorbet. 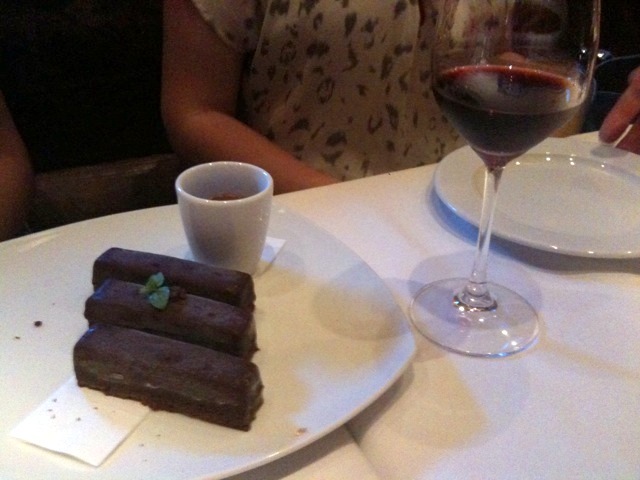 Ice Cream Bars ($12.50) – Chocolate coated Tahitian vanilla ice cream and brownie dulce de leche sauce. Paired with Elephant Island Framboise, BC 09 ($9.75) dessert wine – Its sweetness was 10 on the scale married successfully well with the richness of the ice cream dessert. This wine was truly liquid raspberry heaven: Fresh, tart, and rich, all at the same time. “It’ll take you back to the raspberry patch of your dreams”. And one of my friends described it as “raspberry jam in a glass”. 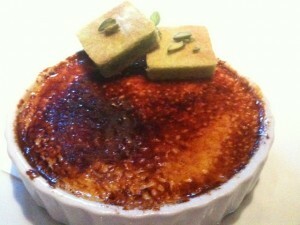 Orange Blossom Creme Brulee ($11.50) – Served with flourless pistachio squares. My friend Krystle and I both ordered the creme brulee, but should have shared one. The portion size was unexpectedly large, although unbelievably delicious. I didn’t feel the pistachio squares were appropriately paired with the subtle orange flavours of the cream brulee, so I enjoyed the flourless squares separately. And to complete our exquisite evening, the kitchen send out lovely macaron happy birthday treats for us to enjoy. 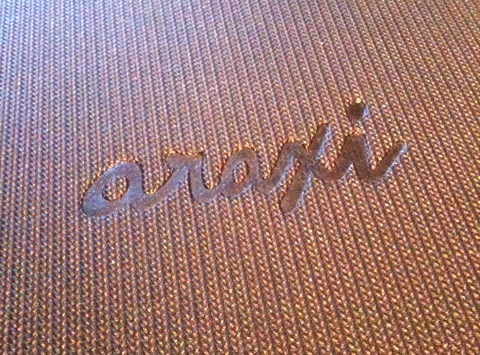 Service was impeccable — I’d give a shout-out to our server right now, if only I could recall his name. 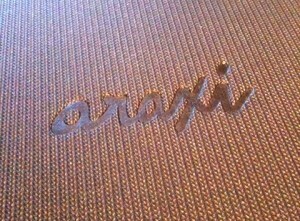 Overall, Araxi offers first-class service, elegant surroundings, cozy atmosphere, and Michelin star worthy cuisine.